The northern Costa Blanca city of Altea attracts many tourists every year. With its extensive beaches and the impressive cathedral it is one of the top spots around. If you booked your hotel in or around the Altea area, transport from Alicante airport is vital. Below we list a variety of transfer options on how to best get from Alicante airport to Altea. The listing contains travel time and cost estimates to give you a better way of comparison. How To Get To Altea from Alicante Airport? Unfortunately no direct bus service is running between Alicante airport and Altea. The best public bus transfer option is via the downtown Alicante bus station. Your one-way tickets will cost you a total of around 10 EUR. Considering some waiting time for the bus at the airport and at the downtown bus station in Alicante, the overall journey will take between 2 to 3 hours. One of the most convenient, but most likely not the cheapest way to get to Altea is by taxi. You can take one directly from outside arrivals area at Alicante airport. The trip to Altea from the airport should take in between 50 minutes to 1 hour. Cost ( approx. 80 EUR ) and travel time will also depend where exactly in Altea you need to get to. Since we get asked about train connections to Altea quite a bit, we mention this travel option here. However this is a real long and rather tough way of getting to Altea from Alicante airport. Since the airport is not connected to any train line at all, you would need to take the bus first. 2.) Get on the TRAM streetcar at station “Puerta del Mar” heading to the north of the Costa Blanca. Traveling by Tram you will need to switch lines twice, one in Alicante and lastly in Benidorm – to get you on your way to Altea. (Find more details and a timetable plus rail map here at our train to Benidorm, Denia and northern Costa Blanca page). The train ride alone should take around 2 hours. 3.) 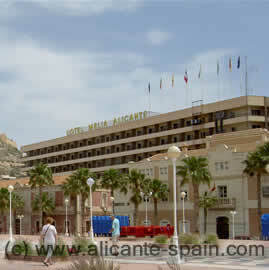 Arriving at Altea’s Tram station, you will need to get a taxi to get to your hotel in Altea. The total cost for bus ticket, train and taxi fare should add up to around 50 EUR. Total travel time for this “extra long journey” is around 3+ hours. As you see this is quite a long trip to get to your final destination in Altea, if you love travelling you will certainly enjoy the TRAM train ride, since it gets you to see a lot of the beautiful Costa Blanca scenery. A variety of private companies run transportation services from Alicante airport to Altea. Especially when travelling in groups, companies like Resorthoppa or shuttledirect offering shuttle services should be checked out. Most of the time their quotes are similar to standard taxi service, but it is certainly worth checking them out beforehand. Not just to get you from Alicante airport to Altea, but also to give you flexibility and freedom while you are on vacation in Altea, a rental car should be at least considered. Altea is nicely located, close to Benidorm and Calpe, with a decent local transport system and the TRAM train getting you around main cities. However, if you travel in a group of people or as a family, public transport can get a bit expensive and you are not as flexible on where you want to go. Hiring a car is at least worth looking into – even if its just to enjoy a much more relaxed holidays in Altea. Finally, as always, in case you came across a cheaper or better way to travel from Alicante airport to the Altea area, drop us a line in the comments section further down. We are always looking to keep this Altea transfer page up-to-date.